Celebrated fashion industry scribe André Leon Talley shares stories about his extraordinary career on Tuesday, May 7 as the special honored guest of the Women’s Association of NJPAC’s Spring Luncheon & Auction 2019, a festive gathering held annually for the benefit of the New Jersey Performing Arts Center on its Prudential Hall stage. The WA, which this year commemorates the 25th anniversary of its founding, also has announced that singer, actress and arts advocate Yvette Glover will receive the Ronnie Goldberg Award 2019 for “Outstanding Contributions to the Women’s Association and NJPAC.” Her award will be presented by her son, Tony Award winning tap dancer and choreographer Savion Glover (“Shuffle Along,” “Bring in ‘da Noise, Bring in ‘da Funk”), who is NJPAC’s Dance Advisor and a member of its Board of Directors. The WA is the largest single fund-raiser for the Arts Center. Co-chairs for the 22nd annual Spring Luncheon & Auction are community leader and philanthropist Deborah Q. Belfatto and Professor Faith Taylor of Montclair State University’s Feliciano Business School and founder of Resiliency Center. A networking reception and silent auction kicks off the event from 10:30 a.m. to noon in the lobby of elegant Prudential Hall, followed by the luncheon and program on its stage until 1:30 p.m.
A student of NJPAC’s arts education programs, acclaimed 17-year-old jazz vocalist Alexis Morrast gives a special performance at the Spring Luncheon & Auction. Much like another Newarker, the “Divine” Sarah Vaughan, Morrast also is a title holder from “Amateur Night at the Apollo” (winning twice) and captured first place in television’s “Showtime at the Apollo,” hosted by Steve Harvey. A singer from the age of 3, she was named Hot House Jazz Guide’s “Best Up and Coming Young Artist” in 2017. Attended by hundreds of guests dressed in colorful, garden-party attire, the WA’s springtime tradition features a raffle drawing and mobile bidding on must-haves like luxury vacations, high-end designer accessories, and tickets to the hottest concerts. Past speakers have included author Grace Bonney and celebrity model Ashley Graham. Presenting Sponsor of the Spring Luncheon & Auction 2019 is RWJBarnabas Health. Underwriters include Prudential, The MCJ Amelior Foundation and United, the Official Airline of Spring Luncheon & Auction 2019. The deadline for reservations is April 19. To register online, click to NJPAC.org/SpringLuncheon or email womensassociation@njpac.org for additional information. The Women’s Association of NJPAC (WA) is celebrating 25 years and over $52 million raised to support NJPAC and programs that enrich the lives of our current and future generations of cultural citizens. When the WA was established in 1994, its organizers could be counted on two hands. Since that time, the WA has grown – to some 2,000 members strong today – to help NJPAC achieve its dreams. Many of the most influential and powerful women in the state lend their time, talent and treasure to support arts education for our young, champion Newark’s remarkable evolution, and advance NJPAC as a home for world-class artistry. For years, the WA has worked with the Arts Center to fulfill its mission to innovate, educate, collaborate and advocate. For more information, visit wanjpac.org. Follow the WA at @njpacwomen, #WAluncheon and NJPAC.org/women. 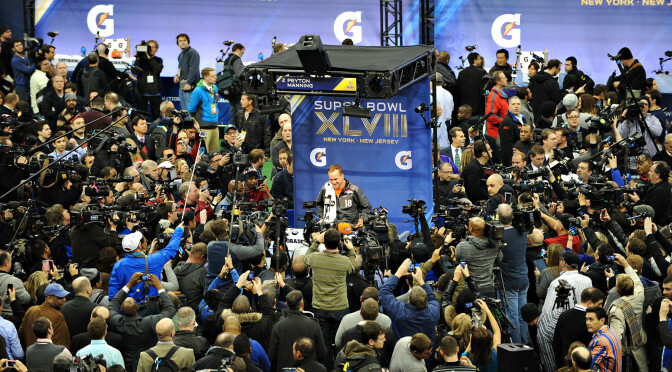 Media from around the world gathered at the Prudential Center in Newark, NJ on January 28th, 2014 to catch a glimpse of the coaches and athletes battling at MetLife Stadium this Sunday for Super Bowl XLVIII. HipNJ corespondent, Lisa Marie Latino, chatted with A-list media personalities Rich Eisen and Hank Azaria, as well as top players and coaches from the Seattle Seahawks, including Pete Carroll, Michael Robinson and Kam Chancellor. Former players Shaun O’Hara of the New York Giants and Cecil Martin of the Philadelphia Eagles voiced their excitement over the Big Game being held in their beloved state. And retired Rutgers defensive tackle, Eric LeGrand tells us what team he’s rooting for! Find out why New Jersey is the ultimate Super Bowl host by watching now!